The Good Guys: How Low Can the Ratings Go Before It’s Cancelled? After a disappointing debut last spring and a lackluster summer run, many were surprised that FOX kept The Good Guys on the fall schedule. In hindsight, FOX execs may be wondering why they did as well. 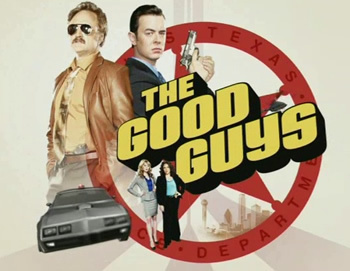 The Good Guys is an action comedy that pairs a washed-up, old-school cop (Bradley Whitford) with a young, by-the-book detective (Colin Hanks). Others in the series include Jenny Wade, Diana-Maria Riva, Jennifer Besser, Kimberly Lynn Campbell, Kennith Edwards, Nathan Fane, and Arthur Wooldridge. The May premiere attracted a disappointing 1.5 rating in the 18-49 demographic and 4.93 million viewers. That put the TV show’s debut in fourth place in total viewership and tied for third in the coveted demographic with NBC’s Minute to Win It. Not a good start. Over the summer, airing on Monday nights, Good Guys only mustered an average of a 1.2 rating in the demo and 4.01 million total viewers. FOX decided to cut the run short in August and saved the remaining new episodes for the fall season. Unfortunately, Good Guys has been performing even worse this fall. The first episode attracted just a 0.9 demo rating and 2.8 million viewers. The ratings have fallen even lower since then, consistently placing in fifth place for the timeslot. Last Friday, viewership dropped 25% in the demo, hitting an all-time low with a 0.6 demo rating. FOX has six episodes of Good Guys left and, understandably, there’s been no word about the network ordering any more. With ratings like these, the network will either pull the remaining episodes or just let them run out. Either way, it’s impossible to imagine that Good Guys won’t be cancelled. What do you think? Do you like Good Guys? Why have people been watching other things on Friday nights? Anything you would change about the show? The Good Guys: FOX TV Show Ending Early; Will It Be Back? The Good Guys: New FOX TV Show; Cancel or Keep It? Love this show! Please keep it join! Please sign the petition to keep The Good Guys. Please take 5 minutes to write Mr. Kevin Reilly, President, FOX, PO Box 900, Beverly Hills, CA 90213-0900, RE: The Good Guys . This show is too hilarious and entertaining to be canceled. I watch this show online on hulu. Do those count as ratings? I just don’t have time to watch on friday nights. I hate tv with all the reality. The good guys and white collar are the best shows on tv. I HOPE YOU GUYS KEEP GOING! or else I will cancel my uverse account. What???? I was waiting for the season premier but it never came and now I see that it has been canceled?! I watch it on Hulu (same with everything else). I doubt the viewership count includes Hulu and a lot of people are now switching to watching shows on that. Really disappointed it is being canceled. What the hell? This was the funniest show on TV! Part of the reason it had bad ratings was because the marketing for the show sucked! The team responsible should be fired. I hope this show gets picked up by a network that can get it the proper exposure. Another was the timeslot. We DVR’d it but looked forward to every episode. Really sad to see this one go. Good Guys cancelled? No, please say no! What is the matter with these clowns that run Fox. The time slot was bad, but I really like the show and watched each one. I am really disappointed with Fox. This show is so funny. A Friday night audience is hard to capture. Most people usually having dinner out late on Friday nights. The cast is spot on. Don’t cancel. My husband and I want to see more. Seems like shows that are not in the mindless idiot Reality catagory do not last too long. Although not the best comedy/action show, it is at least entertaining. Awesome show, but I guess people don’t know about (or aren’t enticed by the promos). Hope this show sticks around. The Good Guys are the best show on TV. It’s great but Friday nights are not good. The people that I know that watch and talk about it never watch it on Friday. We are working or have lives. We all watch it online. The people I know don’t watch TV that way. But don’t take it off your crazy there will be nothing to watch.